It’s a fine Saturday morning, the road is dry and people are quietly commuting to their destinations. But in a split second all that changes for the driver of the late-model Toyota Camry that's nearly broadsided by a hatchback merging onto the same piece of blacktop. Travelling at around 60 km/h, the Camry driver yanks on some right-hand lock and stomps on the brakes to avoid the imminent collision; the rear-end of the Camry breaks grip and emits the sort of tyre-shredding howl that’s invariably followed by a loud bang. The Camry is now oversteering towards a line of traffic on the opposite side of the road and, reacting, the driver counter-steers to bring the car back into line. Already, the driver has exceeded the ability of many others on the road - but it’s not enough to get him out of trouble. As the front tyres grip, the rear-end snaps in the opposite direction and the Camry now spears to the left. And there's no stopping it - it missiles up a driveway and then ploughs through the front of a house, destroying a wall and causing an unknown amount of financial and physical pain. In the first of this three-part series we look at the origins of stability control, its operation, benefits and variation in calibration strategies. Following this, we’ll look at views and opinions surrounding stability control and then in the final part, we have a world exclusive - coverage of the first commercially available interceptor that allows user-adjustment of factory stability control! Electronic stability control is not an entirely new technology – it’s merely a logical progression from ABS (anti-lock brake systems) and traction control. As you may be aware, a vehicle’s ABS monitors the rotational speed of each wheel and can identify when a wheel is locked during hard braking. When a locked wheel is identified, the ABS module releases some hydraulic pressure applied to the brake of that particular wheel. This allows the wheel to turn and, as a result, adhesion and control are regained. The driver is now able to steer the car and avoid collisions rather than ploughing ahead or spinning out of control. 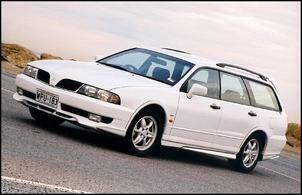 ABS first appeared in production cars during the mid 1980s and can be found in almost every car manufactured today. 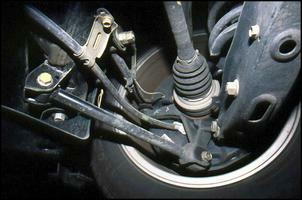 This photo shows the wiring leading to a wheel speed sensor (seen to the left of the driveshaft). 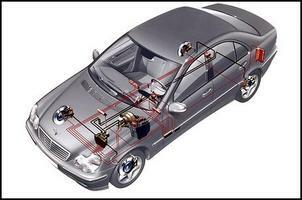 The second contributing technology is electronic traction control. Typically, a traction control system relies on the same wheel speed sensors as employed by the ABS. However, the traction control system monitors wheel speed to identify when the driven wheel(s) is spinning faster than the others. This occurs when the driver applies too much power for the conditions. When a spinning wheel is identified, the traction control system will intervene – it will either reduce engine power (by reducing throttle opening), apply brake pressure to the spinning wheel or a combination of the two strategies. This intervention reduces or eliminates wheel spin during acceleration and the driver is able to maintain steering control. Traction control first appeared in production cars during the late 1980s and is now available in most high-power vehicles. ABS and traction control are the primary ‘building blocks’ in a stability control system - already, there’s the ability to brake individual wheels and reduce engine output. The final necessary ingredients are a yaw rate sensor (which identifies how quickly the car is changing direction), longitudinal and lateral G sensors and a steering angle sensor. Some systems have additional inputs such as brake fluid pressure and throttle position. 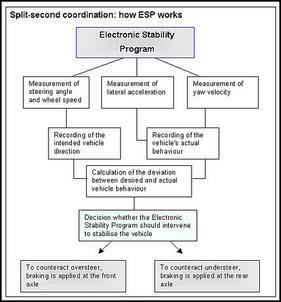 Lastly, a stability control computer is required to analyse the sensor inputs and determine the appropriate action to maintain a safe vehicle attitude. The stability control computer is programmed with complex strategies to reduce vehicle understeer and oversteer and, therefore, enhances safety. 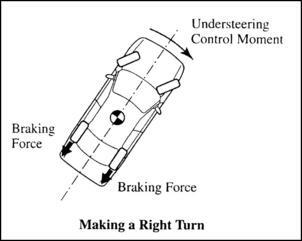 For example, if a vehicle is understeering, the stability control system will typically brake the inside rear wheel to pivot the car towards its intended line. 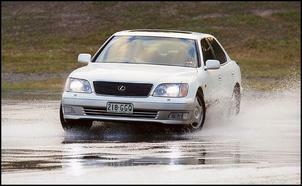 But note that calibration and strategies can vary depending on the vehicle – for example, in a late-model Lexus LS400 both rear wheels are braked to reduce understeer (as seen in this illustration). 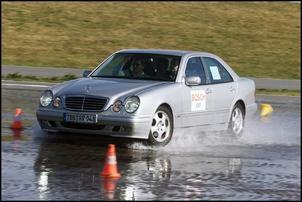 Electronic stability control first appeared in top-line Mercedes-Benz models during 1995. Today, stability control is standard across the entire Mercedes-Benz range and is available in many cheaper marques. In vehicles equipped with ABS, traction control and stability control it can be difficult to determine which system will assist you in different driving conditions. Let’s take a look at a couple of scenarios and explain what happens. In the first scenario, let’s consider a child running in front of the car while you’re driving at 60 km/h. You stomp on the brakes and, in an older-tech vehicle, one or more of the wheels would lock and you would likely plough ahead with minimal steering control. The result could be fatal. However, in a later-model vehicle with ABS, the vehicle will decelerate as quickly as possible without locking wheels – this means you’re able to swerve around the child while keeping your foot firmly planted on the brake pedal. In this instance, stability control typically makes no difference. But now let’s add a slippery road surface. When you attempt to steer the vehicle during hard braking it is possible that the tyres will lose lateral grip and the vehicle may slide into oversteer or understeer. In this situation, ABS won’t assist you because all four wheels are turning at a relatively normal speed. However, the stability control system will recognise an abnormal relationship between steering angle, individual wheel speeds and yaw. 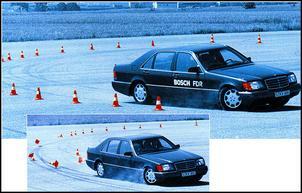 The system will then apply the brakes to individual wheels which helps reduce/eliminate understeer or oversteer. Typically, stability control is intended to operate in low grip conditions (such as ice, mud or a greasy road) or when the driver is pushing the boundaries of control in normal driving conditions. Stability control systems can be calibrated to provide different safety and handling characteristics in the same way each car has a unique chassis balance - no two systems are identical. Some stability control systems are calibrated solely as a ‘safety net’ to catch you in an emergency while other systems also provide an effective handling aid. 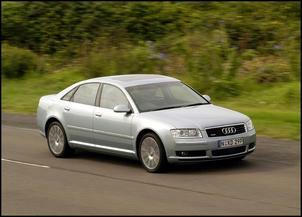 In some vehicles (such as the Audi A8), the stability control system is calibrated with the primary focus on safety. When testing the A8’s handling in dry conditions, the front-end can be provoked to run v-e-r-y wide (understeer) before there’s any stability control intervention. However, in wet conditions, the system is more active – individual wheel braking can be felt at times when the vehicle would be understeering in dry conditions. On the other hand, other cars (such as the Honda Accord Euro) use a different strategy. The Accord Euro uses a brilliantly calibrated stability control system that is subtle, progressive and intervenes only at high cornering levels. It’s the perfect way to complement a naturally well balanced chassis. Interesting, Ford Australia claims that different stability control calibration is employed across the current BF range. In Fairlane and LTD models, the stability control is calibrated for early intervention while the shorter wheelbase Fairmont Ghia uses slightly later intervention. The system in high-performance XR6 Turbo and XR8 models is calibrated to intervene quite late to give increased driver control. DSC (Dynamic Stability Control), ESP (Electronic Stability Program), Advance Trac, Active Handling System, Precision Control System, Stabilitrak, DSC (Dynamic Stability Control), VSC (Vehicle Skid Control), VDC (Vehicle Dynamics Control), VSA (Vehicle Stability Assist), PSM (Porsche Stability Management) and DTSC (Dynamic Stability Traction Control). For example, some late-model Mitsubishi models are equipped with a trace control system which combines with a conventional traction control system. Although not a ‘proper’ stability control system, trace control monitors steering angle, throttle position and individual wheel speeds – there’s no yaw input so, really, the system can’t properly detect vehicle dynamics. Instead, if the system determines you are travelling too fast for a given steering angle and throttle position, it will reduce power by partially closing the throttle or cutting fuel delivery. This approach merely slows the vehicle – there’s no individual brake control and, therefore, it doesn’t control the stability of the vehicle.